3/4" - 1" scale cream soft plastic refrigerator, stove, and 2 kitchen chairs by Marx for Cohen. 1 chair missing a leg. 4 pieces for $4.00. 1/2" scale green plastic TV/Stereo console. Excellent condition. 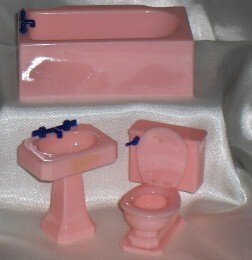 1/2" scale pink and tuorquoise plastic bathroom set includes: hamper, tub, sink, and toilet with moveable parts. Good condition. 4 pieces for $10.00.